← Ladies Who Lunch, Torrington, Conn.
Red Barn, July 1, Roxbury, Conn. The billowing clouds on this first day of July warranted a trip to rephotograph the red barn that I depicted on New Year’s Day. Though the light was high overhead this time, the summer day made up for it. My digital diaries and altered states photographs are my way of sharing my personal vision. These images reflect my daily life and surroundings. I would like to range farther in my photographic journeys. But in the meantime, as any photographer knows, the images are at my doorstep. This entry was posted in Farm Views and tagged Barns, Clouds, Farms, July, Landscape Photography, Red Barn, Sky Photography, Summer, Vistas. Bookmark the permalink. 1 Response to Red Barn, July 1, Roxbury, Conn.
Unbelievable shot, really neat!!! 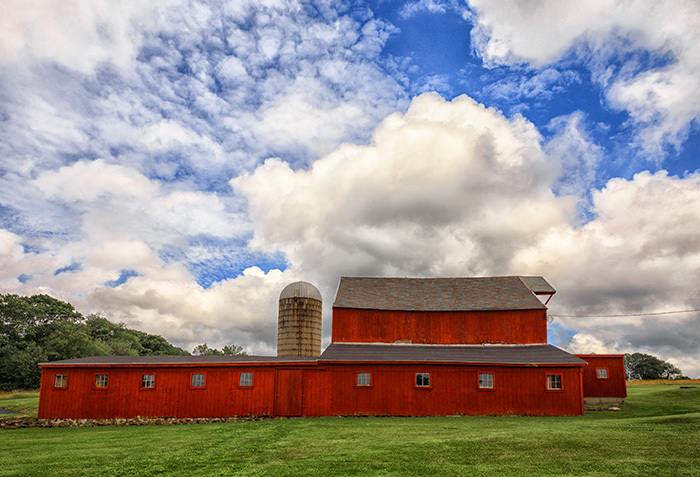 Nice play of clouds versus barn!